A Red Sonja comic aimed at kids? A RED SONJA COMIC AIMED AT KIDS?! What color lotus are they smoking in the offices of Dynamite Entertainment that made anyone think this was a good idea? More, what foul gods did they offer unspeakable sacrifices to that ensured that this fever dream of a concept actually works as well as it does? 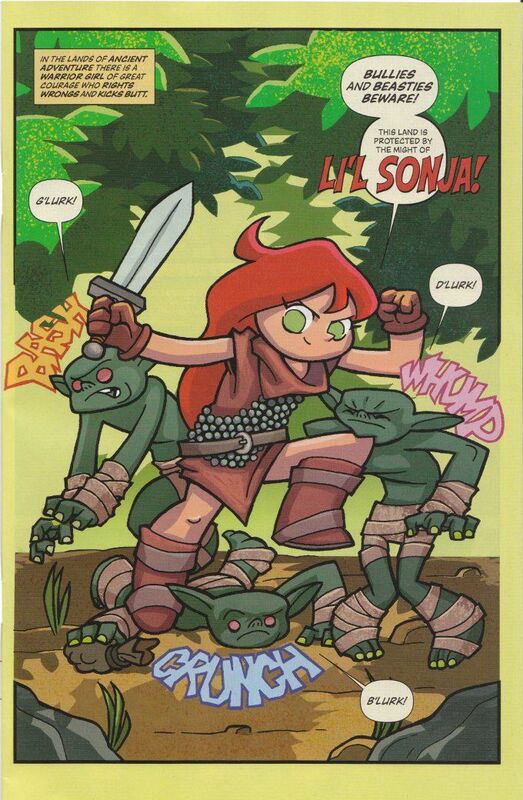 Is it madness to try and make a child-safe Red Sonja comic? Perhaps. But if one is too indulge in such madness, one could hardly ask for a better writer/madman to attempt it than Jim Zub of Skullkickers fame. The script - involving Sonja's investigation of a dragon that steals red things - is hilarious, containing both the unmistakable vibe of classic sword and sorcery as well as enough gross-out humor to enthrall a certain kind of juvenile mind. I think children and adults who enjoy the Captain Underpants books will love it. The artwork by Joel Carroll inspires the same feeling. Cartoonish without being contrived, it is a perfect match to Zub's script. Fans of Red Sonja will want to pick this up for the curiosity value. Parents will want to pick it up for the fun of it. Oh, and so their kids can read it! Yes... so the kids can read it.